The 6'1" Jr PG is a B1G POTY candidate and leads the league in scoring at 24.5 per game. If you haven't had a chance to see him this year you'll find that he is always open because he can create a shot whenever he wants. He's only scored under 20 in seven games this year. A Nebraska team that bottomed out at home vs Maryland went toe to toe with Purdue on the road in the first half. Purdue came out on a run and Nebraska could never close the gap. Carson Edwards led all players with 27. Nebraska comes in here after a true beat down on the road at Penn St and their overall trend outside of PBA makes Michigan and Michigan St look like lost causes. At home Nebraska tends to play defense and typically tends to respond with effort after loses but who knows where those guys are at with all the noise swirling around the program. Purdue very recently finds themselves in a mini slump playing on the road where they haven't scored over 56 points in their two games in February. As poor as Nebraska has looked offensively since losing Copeland this isn't an elite defense that Purdue rolls out so you can see the path to a win. While it's a very dangerous game trying to make Edwards beat you by himself isn't the worst strategy because he will continue to shoot regardless of whether or not he has it. Taking the rest of the team out of the very well ends with them just sitting around like what you often see with Nebraska when it's too Palmer heavy. On offense you'll probably end up seeing a bunch of 3pt shots because that is what Purdue gives you. In some ways it seems like driving to the rim will be extra futile this game as referees are also people who do not want to drive in a blizzard and it's tough to see them slowing down this game with incidental contact. On the other hand hopefully this helps to keep Roby and Borchardt in the game. Due to the weather this has the potential to be one of the smallest crowds Nebraska will play in front of at home this year and a chance at becoming a Devaney Center-esque 'come down to the lower bowl' game. This is the type of game where you can say you can see how the Huskers won this one. It's more likely a game where you can see how they lost it. 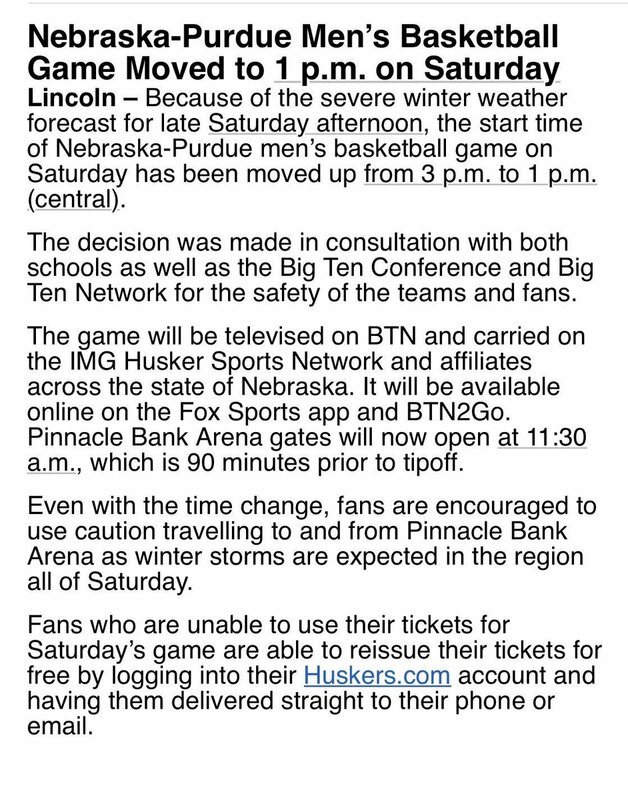 Wonder if BTN plans to bump the Lacrosse game scheduled in that time slot, or just go to one of their other channels? With our luck Penn St/Illinois will go four overtimes.